An outlet specialising in tonkatsu or deep-fried pork cutlets claims to serve perfectly cooked meats that are worth making a beeline for. Opening hours: Monday to Thursday & Sundays, 11am to 10pm; Fridays and Saturdays, closed at 10.30pm. NOT all tonkatsu are the same. Some outlets claim to prepare better deep-fried pork cutlets than others and have their own proprietary methods of preparation including using imported ingredients and sauces. At a recent food review at Tonkatsu by Ma Maison @ Eat Paradise in 1 Utama, PJ, I had a BIG tasting of a variety of tonkatsu items, which the restaurant takes pride in. I was taught the proper way to eat tonkatsu and told how the restaurant?s pork loin is given special treatment prior to being cooked. ?Ma maison means my home or house in French. We want customers to feel at home when they dine here,? said Lee Yew Jin, general manager of the restaurant, who explains that Ma Maison?s decor reflects its Japanese heritage. Multi-shaded denim is stucked piece by piece on the wall to create an illusion of Mt Fuji. The walls are also adorned with Japanese paintings and stacks of charcoal in glass display cases, as a homage to the traditional Japanese methods of preparing tonkatsu. The open kitchen concept allows customers to see the meticulous food preparation. Big deal: Jumbo Ebifurai may not be lobster but it has a firm texture and sweet, gratifying taste. Tonkatsu by Ma Maison was founded by Akinori Terazawa in Nagoya, Japan, in 1976. An avid food connoisseur and a very demanding customer, Terazawa set up his own tonkatsu outlet after failing to find the perfect tonkatsu. His tonkatsu outlet is said to serve perfectly cooked meat cuts with homemade sauces. To date, there are 16 outlets across Japan, five in Singapore, and one each in Malaysia and the Philippines. Tonkatsu by Ma Maison, the first and only one in Malaysia, opened in 1 Utama, Petaling Jaya, on Jan 8 this year. It has a seating capacity of 64. A second outlet is scheduled to open in PJ by year?s end. Lee said: ?We strictly observe five main elements to prepare tonkatsu: the rice, salt, meat, panko (Japanese breadcrumbs) and oil (corn). Terazawa has created a way to prepare and enjoy tonkatsu. He wants to give customers an unforgettable experience.? ?We start with grated oroshi (white radish) as appetiser to refresh the taste buds; then tsukemono (Japanese preserved vegetables pickle) to cleanse the taste buds so as to enjoy the real taste of meat.? A special slicer is used to prepare finely sliced cabbage (of the same thickness) and dress it with a tangy roasted sesame dressing. You can easily demolish the mound of juicy, crunchy cabbage with its delectable dressing. The condiment tray (left to right) is for salt, spicy or sweet tonkatsu sauces. ?When you eat the meat, you dip it in finely ground natural (rock) salt to bring out the real taste (and juiciness) of the meat,? Lee tells me. Or dip it in the spicy (I like this better) or sweet tonkatsu sauces. Miso sauce, another dipping sauce, is also a favourite with diners and can be ordered separately to share. To give extra fragrance to your rice, you can grind sesame on your rice or sauce. Ma Maison serves 57 tonkatsu items. There are two types of pork (local pork): the loin or rosu (which has a layer of fat) and fillet or hire (with totally no fat). Lee said: ?The fat is said to make the meat more juicy. Also, all loin are aged (or matured) in a chiller for more flavour.? With meat, I habitually trim off all the fat. But for tonkatsu, I ate my pork loin (Rosu Katsu or Deep Fried Pork Loin) as it should be eaten ? fat and all . The pork loin was absolutely tasty and I liked it more than the fillet (Hire Katsu Set or Deep Fried Pork Fillet, 160g). The fat seemed to make the meat moister and as I savoured the meat, I was reminded of sinking my teeth into my favourite Hakka char yuk (dried version of deep-fried five-spice pork). The (tonkatsu) loin was crunchy outside and juicy within (not so heavily spiced or chewy as the Hakka dish). Normal pork loin is tougher but Ma Maison?s proprietary ageing process made the loin more tender. You can choose Rosu Katsu (160g) or a bigger size portion, Jumbo Rosu Katsu (250g). Here, pork loin is kept in a special chiller (with different timed preset temperatures) for up to a few days and the slabs of loin are checked daily. However, pork fillet, which is already tender, needs no ageing. Special imported panko (Japanese breadcrumbs) supposedly makes Ma Maison?s tonkatsu crispier as the breadcrumbs are in larger flakes. Tokusen Ippon Hire Katsu Set (Special Deep Fried Pork Fillet) is the most tender and premium part of pork fillet. Lee tells me: ?There is only 400g of this part of a pig. Out of this, 180g is used for this dish.? This part of the meat tastes much better than normal fillet. Not only is it more tender, it?s quite juicy too. 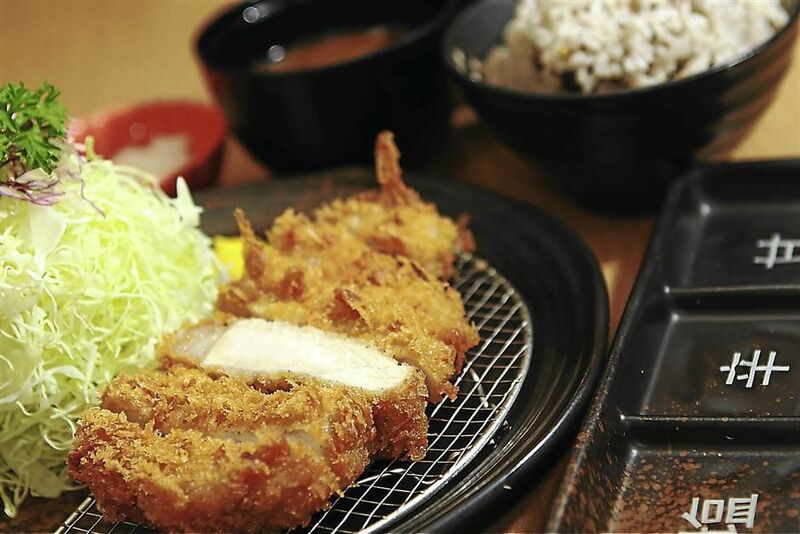 You can also order deep-fried pork cutlets already doused with a topping sauce such as Negi Miso Hire Katsu Set, Miso Katsu or Negi Miso Katsu Rosu Set. Mille Feuille Katsu is Deep Fried Multi-Layered Pork Loin where 10 thin pieces of pork loin (cut to resemble ham slices) are overlapped, breaded and deep-fried. It?s quite an interesting experience to tuck into this specially created pork cutlet for its taste and texture. It is certainly easier and more tender to eat than the fillet. If you want to try chicken, there is Chicken Cheese Roll Katsu Set (Deep Fried Chicken Roll with Cheese and Vegetable (asparagus and carrot) or Chicken Katsu Set (Deep Fried Tender Chicken Cutlet). At Ma Maison, each tonkatsu set meal comes with rice, cabbage and tonjiro soup (miso soup with pork) which are refillable. Lee says the tonjiro soup is cooked overnight with 25 types of ingredients, resulting in a more intense and flavourful miso soup. Rice is a choice of steamed white or multi-grain rice. I loved the latter with its interesting mix of nine grains. Mameton and Rosu Katsu are amongst the outlet?s bestsellers. The Mameton set consists of assorted pork loin, pork fillet and prawns. This set comes with both rice and nyumen noodles (can also be ordered separately). Jumbo Ebifurai (Deep-fried Jumbo Prawn), which costs RM59.90 for two huge pieces, is worth splurging on. The unbelievably large local prawns taste almost like lobster, though the latter is much firmer and sweeter. You get more value for money as the prawns here are served without the heads. Kakifurai (Deep-fried Oyster), which costs RM33.90, comprises five (XXL or the largest) oysters from Japan! Most of us have slurped down fresh oysters but fried oysters can be tasty too! You can also try Crab Croquette Set (two pieces) in a set. Seafood is best savoured with the restaurant?s own tartar sauce, which is a creamy white mayonnaise-based sauce. 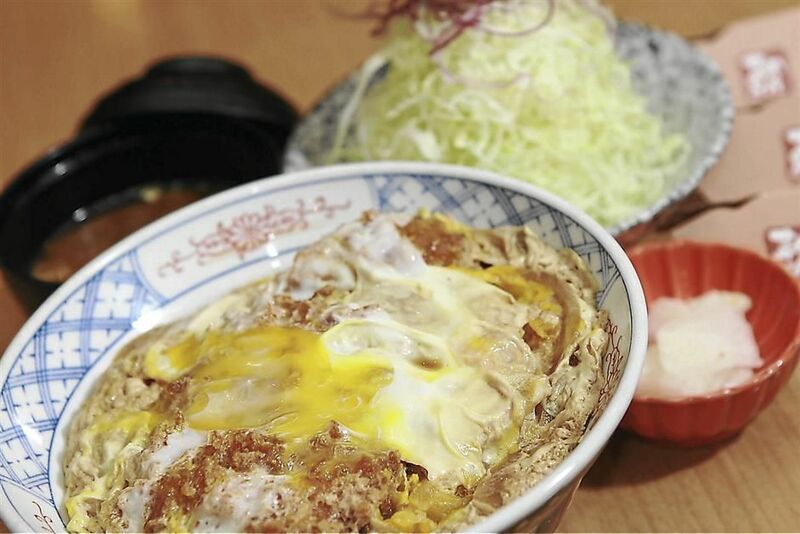 Katsu Don, deep-fried pork loin topped with egg and special soya sauce, is a popular dish at Tonkatsu at Ma Maison. I was bowled over by Katsu Don, a rice dish with deep-fried pork loin topped with egg and special soya sauce. It is a gratifying one-dish meal if you?re really hungry. Or if you like Japanese curry, opt for Homemade Katsu Curry (Deep Fried Pork Loin with Japanese Homemade Curry Sauce). At Ma Maison, you get free Roasted Barley Tea, a caffeine-free, roasted-grain-based tisane made from barley, to go with your meals. This tea is said to be cooling for the body after all the fried stuff. This tonkatsu outing is one big eating spree. I have never eaten so much deep-fried pork cutlet (and such a variety) at one go. It would make me go completely carnivore! I consider such an indulgence a rewarding lesson (besides one of the perks of the job) and probably, the tonkatsu meals at Ma Maison will be my yardstick for all tonkatsu dishes in the future. A word of advice: It?s best to enjoy your tonkatsu as soon as it arrives at your table.